Sleep is one of the must ingredients that either can make it all sunny and live or truly torture our bodies apart. In the latter, we mean the insufficiency of sleep due to the preventable disturbances and interruptors. What is considered a good night’s sleep? Our bodies rebuild and chuck away the by-products from the chemical reactions taking place during the night phase during the REM hours. 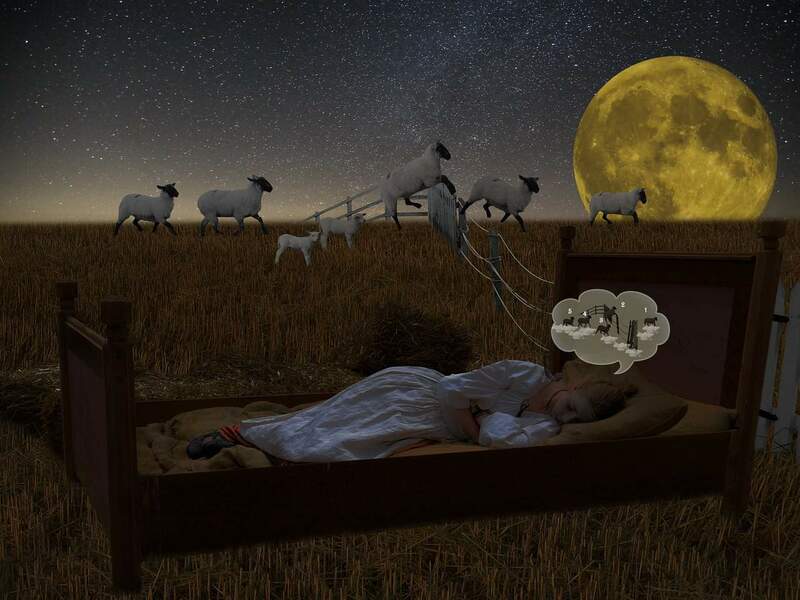 A kind of sleep that occurs at intervals during the night and is characterized by rapid eye movements, more dreaming and bodily movement, and faster pulse and breathing. If we do not get a REM phase in our lives on the regular basis, it could lead to a chronic bodily inflammation, which translates in many chronic diseases like hypertension, heart diseases, insulin resistance, obesity, and cancer. Not exactly what we want and are looking forward in life, is it? Getting the right amount of sleep is a remedy granted to us by Nature by birth to use for self-healing and rest. Here, we’d love to touch upon the factors that can interfere with our sleep and make it miserable. To be aware of these factors is the first step to making a change. Here are simple and proven steps to a good night’s sleep with HOW TO sleep better tips every single night. Electronics are a huge part of our lives. We do need them for so many things! However when it comes to a good night’s sleep, do a favor to your body and mind and put those electronics aside at least one-to-two hours before you go to bed. Here’s why. Buzzing, ringing during the night causes interference in our sleep. Even if it is a minute interference, it can ruin our REM cycle and stop such important processes like rejuvenation to take place. And when we do it often and on the regular basis, the body will give us a good picture of ourselves: what we look and how we feel. Sluggishness, skin tone and color, chronic fatigue – things like these can easily take their permanent presence. The light emitted from the electronics screens can suppress melatonin, the hormone that helps our bodies to shut down for rest. The stats tell us that two or so hours in front of the electronic screen can prevent us from getting into REM sleep. Sleeping in cooler temperatures can actually do our bodies good. The best sleep comes at about 60-68 F. During the sleep phase, our bodies go through the process called thermaregulation, when they are trying to cool the core body temperature for optimal rest. Allowing our organism to do it easier, dialing down room temperature would help. Wrong! All the emotions and feelings that we my go through while watching our TV shows and movies can easily get a spike of adrenalin – from stress, fear, excitement – which can cause a counterproductive effort when we are trying to go to sleep. Adrenalin and melatonin do not go together. The role of one is to force a “run and jump” action. The role of another is to calm down and go to sleep. It is a good choice when we keep our TV sets in our living and media rooms. Even if we are supposedly are not bothered by light when we go to sleep, any light – be it from electronics, night stands or outside – can cause sleep interruption. Our skin has light receptors. The absorption of any light can trigger hormones that will wake us up and keep us awake. Having quality blinds that prevent the outside light to mess with our sleep cycle would improve the quality of sleep you are getting. the Best Bed Sheets to Keep You Cool! When we spend 1/3 of our lives in bed – sleeping – it is a good idea to invest in quality bed every 7 to 8 years. Little do we know that our bed mattresses can double in their size during that time period. What do you want? We sweat, we lose our skin cells in millions while we are enjoying our night’s sleep. To get a good mattress after 7-8 years is simply a must. For every night’s good sleep, do invest into your bedding, too. Taking into account that cooler temperatures do our bodies good during sleep hours, look for bed sheets that will protect you from cold, yet are breathable and pleasant to be in. From my personal use of these sheets, these are some of the thinnest 1500-thread covers I’ve ever had in my life. Soft and breathable, PeachSkinSheets would be your go-to bed sheets for every season! No exaggeration. Using SMART Fabric, high performance sleep technology textiles, the company weaves together their bed sheets into a welcoming alcove for a good and tight night’s sleep. Warm Sleepers Stay Cool, Cool Sleepers Stay Cozy. Anti-Pill…No Little Balls (Rolly-Pollies) on Your Fitted Sheets. 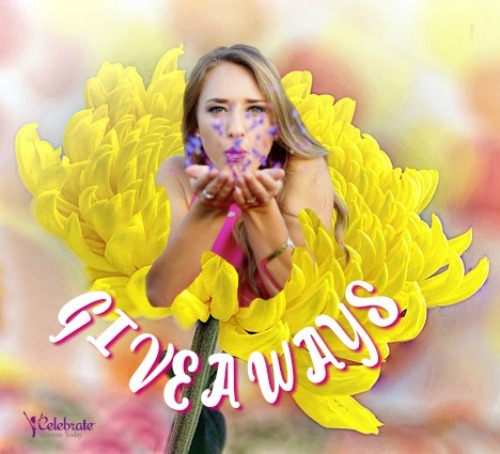 One huge savings benefit that PeachSkinSheets does every month is having an everyday sale for two of their colorful bed sheets products. A huge plus is you can easily request FREE color swatches to match to your bedroom colors and existing interior. – celebrate your skin every night – PeachSkinSheets will help! And to keep your own skin beautiful, get a few extra pillow cases to change them every 3 days. Our pillow cases absorb our sweat and anything that is on our facial skin. To lower a risk of recontamination – change your pillow cases to keep your skin healthy and glowing! PeachSkinSheets offer individual sets with hypoallergenic, anti-microbial pillow cases. During a regular wash cycle, PeachSkinSheets activate their wrinkle release for smooth look and feel. We love our PeachSkinSheets products! My cats attack anything that is flying in the air – every time we make the bed, our cats are here! 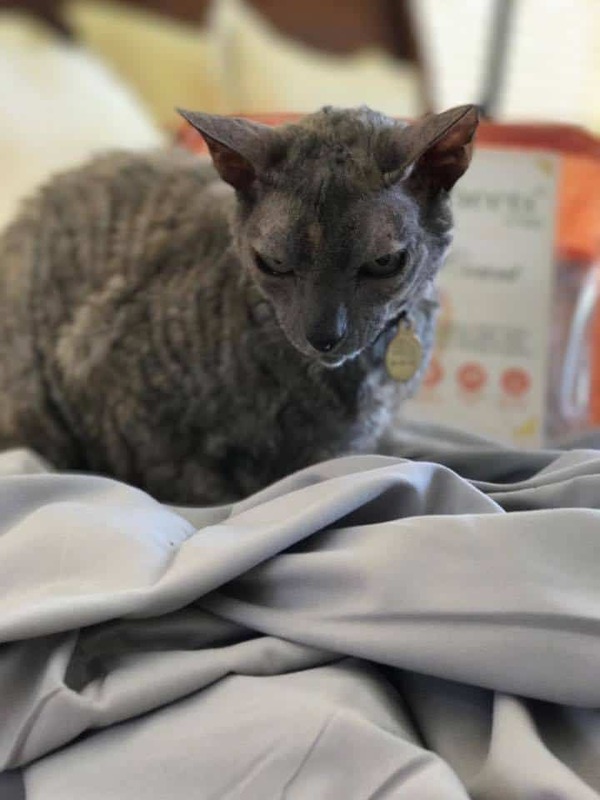 This Curious Cornish Rex Finds Her Way Into the Laundry Business! Every Time We Make the Bed – She’s Here To Help. Celebrate A Healthy, Tight Sleep Every Night! Isn’t it a familiar scene – your cat loves to groom itself in clean laundry? 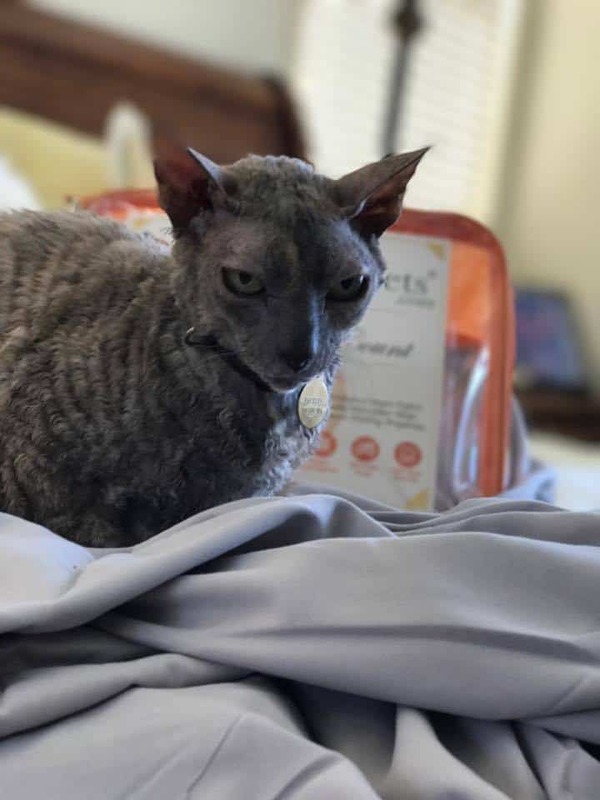 I was unpacking my new @peachskinsheets when Fro jumped up into the camera shot. This cat knows good from bad! 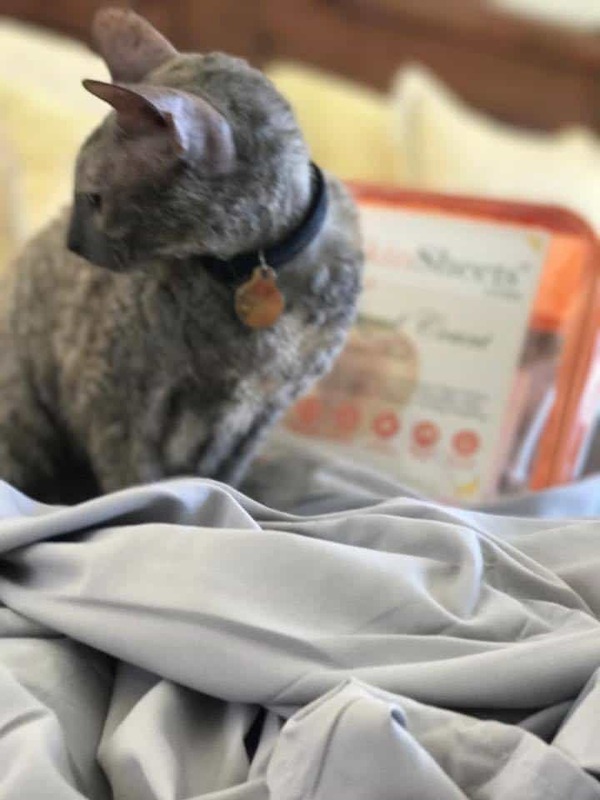 #PeachSkinSheets – Cat-Approved, Mom-Delighted. I love sleeping but I need to find a balance between I’m too hot and I’m too cold. These sheets sound like they might be the answer I’m looking for. I am a terribly light sleeper and have a hard time going back to sleep if I’m woken up, so using a fan or a white noise machine has become a must have for me! I’d love to try these breathable sheets. Thanks for these awesome tips! PeachSkinSheets have been on my bucket list for a long time…. i am not very high maintenance when it comes to comfort but i ordered the swatch and the material feels really good. These sheets sound wonderful. I tend to get overheated during the night- so sheets that are breathable are a must for me. Plus, these sheets look like they are super soft. I would definitely love to try these sheets. I only hear great reviews for the Peach Skin Sheets. They sound like they would hold up well and comfy to sleep on. I have been thinking about getting new sheets for awhile now. These look like just the ticket! I like a nicely-colored sheet, that matches my bedspread or comfort, but I love a cozy, soft set of sheets, that makes me feel like I am sleeping in a cloud! I have a set in mint green which are really nice. Good luck to the winner. PeachSkinSheets are a fabulous product. They are well made and of high quality. I have one set of their sheets and hope to eventually have all our sheets to be PeachSkinSheets. I love these are no pill! I’d love a set so i can get rid of the ones i have that pill! I prefer dark colors in my bedroom. Blues, browns, grays, or black don’t seem to reflect light and are easier to relax around. I never knew pitch black was the best way to sleep, I usually have a nightlight on in my room or some lighting but will have to try this out. I usually cannot make it past 10:30 pm , the eyes just will not stay open it seems. But I do sleep pretty good at night. Soft and comfortable sheets make all the difference to me when sleeping. I’m way overdue for new bedding! I would love a new set of PeachSkinSheets as I now have night sweats. I like cool air in my face while I sleep. Its typically my fan in my face and me balled up in my comforter. I consider a good night sleep these days is when I don’t have night sweats. These are all good tips. I can not sleep if there is any light on in my bedroom and I keep the doors closed and my curtains pulled at night. Good tips. I want to try these sheets out. Great tips. I’m a sleep tech and definitely agree with all of the advice in this article! Great job! Being a busy working mom a good nights sleep is hard to come by. We have a set of these and love them! They are soft and comfy! I don’t agree with the no TV for me! LOL I can’t fall asleep without it! I do set the sleep timer so it’s not on all night. I need new sheets. These sound so soft and luxurious. The sheets sound great. I’d love to try a set. Thanks for the chance! My main interferences with getting a good nights sleep are using my cell phone and being too hot in bed!! These sheets look comfy and cool though!!! The sheets sound super comfortable, and I like the colors. I love that these sheets are breathable as I often get hot at night. Also – love the cat, they always want to be around you but they’d never admit it! These sheets are awesome, I love all the choices of colors available. I like the tips you give. I am going to try these tips. I have wanted these sheets for a very long time. They sound terrific! I have insomnia. A good nights sleep is rare for me. I gave my daughter a set of these sheets for Christmas and she always tell me how much she loves them. These sheets just look absolutely to die for. So comfortable, the perfect blend of fabrics. Excellent tips. I love to sleep. I have admired these sheets for a while. These sheets sound like they are so soft and comfortable. I love all the colors available. I can’t wait to try these sheets! I these sheets sound amazing! I sleep with a cool room but always still seem to manage to sweat in my sleep! Great sleeping tips (I found that just going to bed at the same time every night helps). I love that Peachskin Sheets are anti-piling and I love all the color choices! The swatches are awesome to do color matching! As a person with Chronic Fatigue Syndrome, I’ve found many of these tips to work quite well. I especially find having the room completely dark is key. Also, having the room cool helps a lot. If it’s at all warm, I’m uncomfortable and it wakes me. I like that their pillow cases have great absorption and wrinkle release in the dryer. So neat! The colors are gorgeous too. Simple things work effectively when it comes to a better night’s sleep. We just need to do these steps. All great sleep tips! I especially agree with having the room completely dark. I turn my phone over so that notification light doesn’t disturb me. These do sound like fantastic sheets. I love that they are anti pill, I hate the feeling of pilled sheets and find it hard to ignore to sleep. i would very much like to test their smart fabric against my night sweats. This list was right on point! I definitely notice when I have crappy sheets on my bed it affects my sleep. Very awesome tips for getting a really good night’s rest. Thank you for the giveaway! I would so welcome a soft cool sheet for a really good nights sleep. love you can get free color samples. Sound just Great !!! I have two sets of these sheets and they are the best. I love how soft they are and how cool they keep us at night. I am a terrible sleeper, but it’s due to waking up in pain & dealing with my illness. Anything that can help me sleep more than 2 hours at a stretch would be worth it, knew most of these, but will be re-trying and also lowering the temp a couple degrees – just in case. Thanks for sharing, these sheets look divine, would love to try them. I don’t care what color the sheets are as long as they are comfortable. I got a sample and loved the softness! These are all amazing tips. It seems like my GF has been tossing and turning lately. I will be sure to share this article with her. We just got a new mattress and it has made a world of difference. I have a newborn, so I’m not getting enough REM sleep since he is waking up every 2 hours to nurse. I know that’s only temporary though. Good sleep is so important for our health. Getting a good nights sleep makes all the difference to how my day goes. For me definitely cooler and pitch dark is better. And I want my sheets to be soft and comfortable. I cant wait to try these sheets! I prefer a dark room with the windows open in warmer weather. I cannot sleep with lights or electronics on. I would love to try these high quality sheets. Can’t sleep without a fan, both hubby and I have sleep issues. Would live to try these out and see f it would help any of our issues. I just love your tips. I use a fan on high to deal with my hot flashes. I like to sleep in the cold under a heavy blanket and that’s how I sleep best. I love all the colors and I bet they are so soft. These are great tips. I cannot sleep without a fan for noise and I cannot be hot. I am so hot at night, no matter how low I turn the air conditioner down, that I simply cannot sleep. I just toss and turn. The sheets stay hot. The pillow stays hot. As soon as you lay down, they feel good. 5 minutes later, I’m miserably hot. If these would be cool and stay cool, they would be perfect for me. Most definitely will be cooling my room off before going up to bed, I’d love to get some quality sleep! My dog also likes to get in the laundry basket….with the dirty laundry. I don’t put the clean stuff in there for that reason 🙂 PeachSkin Sheets are the best! It’s hard for me right now to get a good nights sleep. Love the tips. And love the sheets. I hate roly-poly fuzzies on my sheets! Main reason I replace them. I guess my cat will love these sheets. Thank you for tips. I am not sure if age related or what, but the last few years I have trouble staying asleep. I find dark, cold and quite helps..no electronics, tv, food for at least two hours all help me. Quality linens that are freshly cleaned too. My wife suffers from hot flashes at night. We have turned down the heat and turned down the AC. As someone with fibromyalgia sleep is key. Keeping cool and comfortable which these sheets seem to help do would be a great help. Great tips! These sheets sound nice! I would love to try them. You make many valid points here. We try to change out our mattress every 10 years. Not too far off the 7-8 years. I do sleep better especially when we keep it cool in the winter at night. These sheet would really be nice to have. 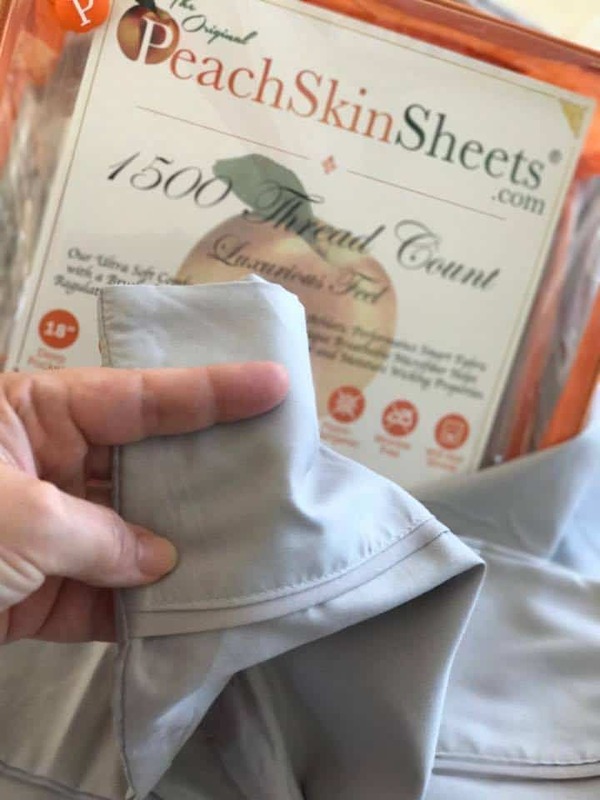 I have heard so many good things about these sheets so I am entering for a chance to win some. I have to have white noise or some kind of hum going. I also like a fan to circulate air. Many thanks for this opportunity! I’m so big on getting a good nights sleep, although I am guilty of not always practicing what I preach. I love these tips and scientific explanations that you give as to why sleep is so important!! Thanks for sharing this article I love it. I’m having trouble sleeping at night. I usually fall at sleep super early and then wake up early as well. I need to get myself a lot of sleep. I could use a lot more sleep than I get. I get up very early and go to bed very late. Looking at these sheets makes me want to go lie down in them. Great tips too. I’m sleeping awfully right now but that’s because no matter how dark I try to make my bedroom it’s still too light. That’s summer for you I suppose! I usually look at my phone before sleep and I’ll have to keep this in mind to get better sleep. These sheets look very cool and I’m investing in a new bed soon. 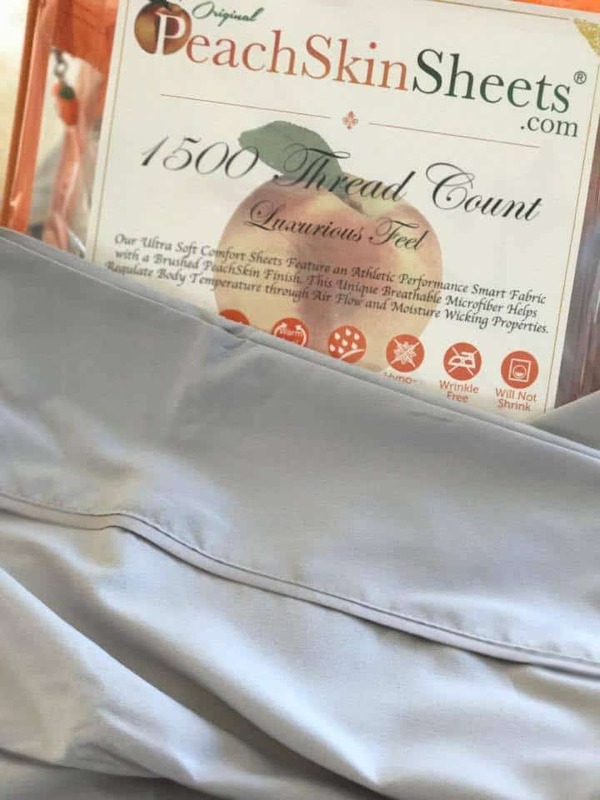 The thread count makes a huge difference when it comes to how comfy the sheets are going to be and it’s definitely going to help you sleep better at night. I value my sleep very much as well, I feel that I am more productive during the day when I get enough sleep. I’m guilty about leaving the TV on to sleep. It stems from childhood when I always needed a light on in my room but as I’ve gotten older any bit of light is enough to keep me awake. I do sleep in a cold room and good sheets! I really do need to take the no light to heart. I have this huge bedroom window that lets in all kinds of light. I kind of like it in the winter as it warms the room and keeps in well lit. But in the summer when the sun comes out at 4 in the morning and I want to sleep… that stinks. :/ So I need to get blackout curtains. It would be so nice – the blackout curtains – your body would thank you! It’s definitely hard for me to sleep most nights. This all reflects on temps of the most part, if too hot I cannot sleep for the life of me. The TV also helps me sleep and reading does as well. You gotta figure out the optimal temperature for yourself and stick with it throughout the year. Obviously, there will be some variations during the seasons, but your body is a smart one to adjust to such minimal fluctuations at home. In the summer, you could cool your bedroom before going to bed. It would help tremendously for you to get the REM sleep. These are some good tips. Who doesn’t like a good night’s sleep? Especially as a mom! Great tips! As a mom to a 11 month old daughter with which we co-sleep ( I believe the term is breast-sleep) I need sleep a lot these days! This would be the perfect thing to get for my parents cat, we love to spoil Grace. I think many people minimize the importance of sleep hygiene!! Following simple steps such as the ones mentinned above can help even people who have had difficulty with sleep for years get better improved sleep – typically the ones who believe they’re different and can’t be helped by such simple steps are the ones that see a bigger difference if they try it consistantly for a sustained period of time (in my experience)! You said is so well about trying to incorporate healthier habits into their lives and do it consistently! The majority of cases could be helped, if they could stick to a tiny change for a period of time, until it becomes part of their life. These are really great tips. I usually play on my phone before sleep and I’m pretty sure this messes up my sleep. I might try sheet though, look really comfy! I will keep this in mind. I wish it could be cooler when we sleep, but to save money, I keep our temperature at 77. But we do have fans, which I also need to sleep. I can’t sleep in silence. It freaks me out. Those sheets look super comfortable! I have never heard of that brand before! I am actually a pretty good sleeper. It’s actually harder for me to stay up past 9 then it is to stay asleep all night long – haha! I need my fan to sleep. No white noise = I am up all night. These are all really great tips to getting a good night’s sleep! Some of these I already knew, but I did learn a thing or two!